-->> (( mystery solved ))..
..one of the references i've used for related work on Donatello's coolest costume. ah sh6t, Kevin .. rad !! I have no problem with the turtles wearing some kind of clothing. Almost as if it shows them as 'evolving'. The lighting on this is just fantastic! Aw yeah, I definitely dig this. 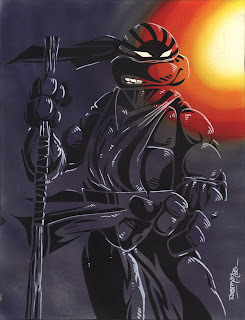 Nice job, Mr. Kevin Eastman! !